We are in the final few blogs on changes made in Magento 2.0 and glad to see the amazing response we have received to our blog series on Magento 2.0. If you have not already read those then we encourage you to do that. In this blog, we will look at the changes made to the pricing and licensing model of Magento and how it impacts both existing and new merchants, developers, partners and end customers. With 2.0, Magento has decided to migrate to a per-business license model from its per-server license model earlier. There will be no limits to the number of production and non-production servers that a client wants to run on. 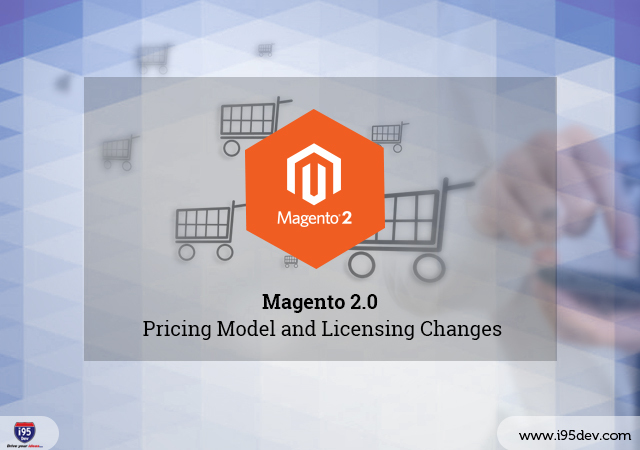 Going forward, Magento 2.0 license pricing will be aligned to the gross merchandise sales value handled by the Magento eCommerce platform. The gross merchandise value (GMV) will mean the total US dollar value of all transactions in year generated through the Magento software. It will exclude 1) all applicable shopping cart discounts and promotions transacted within the Magento Software, 2) shipping and handling charges, 3) taxes, and 4) any other transaction fees. The returns will not be subtracted from online revenues. Licensing Model – What this means for merchants is that they can build out any type of infrastructure they like for their Magento deployment (multiple servers, cloud hosting, and more). License Pricing – While the new licensing model gives merchants greater flexibility removing license cost considerations for hosting, merchants with high gross merchandise sales value might find themselves paying more to Magento than they did earlier. Check out Nexcess. Merchants on Magento 1.x platform have the option to remain in the per server model agreement. While they can continue using their 1.x platform for 3 more years, if they decide to upgrade to Magento 2.0 then they will purchase the license at the lowest band. Licensing Model – This will give partners (developer and hosting) flexibility to try and optimize the Magento server deployment for enhanced performance. License Pricing – There is little clarity on how the new pricing will impact partners. Licensing Model – With deployment optimizations carried out by merchants and partners customers might get to access a faster website. License Pricing – Subject to how the merchants react to the new pricing model, the end customers might see an increase in product prices or discontinuation of other benefits like free shipping, etc. if the merchants decide to pass on the increased licensing costs (if any) to end customers. Stay tuned for our next blog on Magento 2.0 where we will discuss the changes planned for a new and improved marketplace, Magento Connect.